Don’t miss out on what’s behind that door, in the safe, or hidden on the computer terminal. Crack it open. 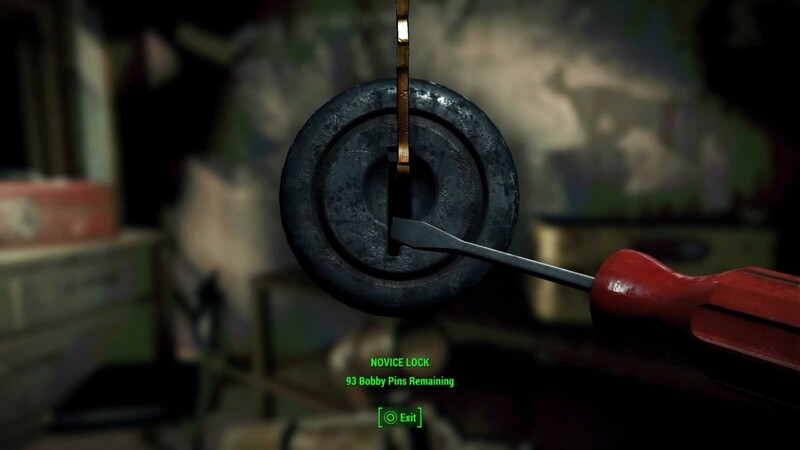 There’s a lot of hidden goods in Fallout 4, just out of your normal reach. Guns, ammo, meds, information and alternate routes are hidden away behinds locked doors, computer terminals, inside crates and in safes. But you don’t have to leave them behind. Here’s how to make sure you clear up all the goods you can. You can pick Novice locks provided you have a bobby pin. Go up to the lock and press Unlock. You now must turn a screwdriver one way and the bobby pin another until it unlocks. You’re looking to find a “sweet spot”. Turn the bobby pin first and you’ll feel resistance through the gamepad. Too much resistance means you’re in the wrong spot. Continue to turn at this point and you risk snapping the bobby pin. Return the pin and the screwdriver to the original positions and start again, trying another area of the lock. The lock rotates smoothly with the screwdriver when you’re close to the right position. Again, if it begins to resist you’re likely to snap the pin, so make slight adjustments to the bobby pin. The less resistance, the closer you are to unlocking. Once you’ve made a quarter turn without resistance the lock will pop open. Bingo, whatever’s inside is yours. To attempt to pick Advanced, Expert and Master locks you’ll need to have the Lock Pick Perk, and Perception over Rank 4. These are essential for a master thief. Each rank of Lock Pick will let you crack the Advanced, Expert and Master locks. Companions: Cait can pick locks up to Expert, just Command her and point her at the door you want to get through. Hacking also has four levels of difficult: Novice, Advanced, Expert and Master. You can attempt Novice by yourself, so long as you have an Intelligence Rank of 4 or more. 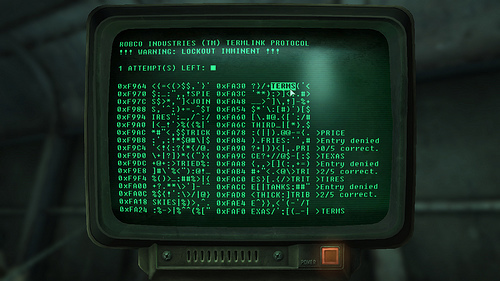 Hacking a terminal looks tricky but isn’t, it’s just a case of deduction. At Novice level you begin with a screen of jumbled text and within that a series of passwords. You’ll get four attempts with each try, and if you fail you’ll be locked out of the terminal for 10 seconds. Highlight a word and press enter. You’re most likely to get a Denied message, but it should also tell you how many of the letters within that word are correct. This is the Likeness you see on the right hand side. If the word SEEMS has a Likeness of 1, then you need to choose another word with one of those letters in it. If it’s a Likeness of 0, choose a word without the letter S, E or M in it. You proceed to try words on a trial and error basis. If you get a Likeness of 2 or 3 you’re very close, so scan the screen carefully for a similar word. There’s no time limit, so don’t feel pressured. However, if you are locked out and have to try 10 seconds later the password will be random again, so previous Likeness letters do not count. To hack any terminal above Novice you’ll need the Hacker Perk. Each Rank of that Perk allows you to hack Advanced, Expert and Master terminals. Companions: Jack Valentine can hack up to Expert terminals. Just command him to do so and he’ll take care of it.